Which of these describes your meetings more closely? 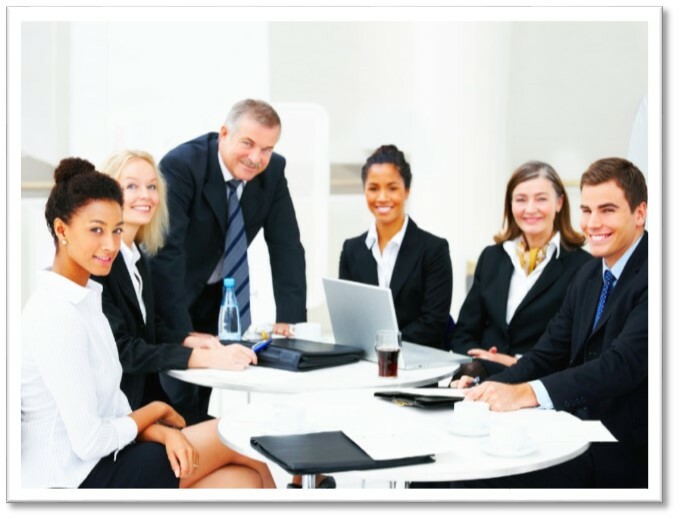 Search Google images for “team meetings”, and it will try to convince you that meetings take place in bright, modern rooms and are full of beautiful people, happy to be there, sipping designer coffee and engaging in positive, meaningful discussion about important things. In reality, any process involving people is usually not so perfect or predictable. Different levels of motivation, understanding and ability to communicate – as well as different personality traits – can all contribute to meetings being a less than valuable use of your time. Are your meetings earning their keep? What impact are your meetings having on your team’s productivity and your company’s success? As with any business activity, it’s important to maintain a focus on return on investment in your meetings. Put simply, if you weigh up all the costs of your meetings (time away from other tasks, travel time & cost, energy / brain-power invested, preparation and follow-up time, etc.) 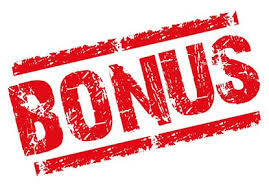 and compare them to the benefits and outputs of the meeting, do you end up with enough of a positive return? Or any positive return at all? Time wasted, relationships frayed, agendas ignored, distracted participants, repeating the same thing meeting after meeting, nobody saying what they really think, too many meetings about meetings … the list of meeting crimes goes on and on. There’s probably no such thing as a perfect meeting, but if yours are anything like the majority we’ve seen, there’s definitely some room for improvement. The good news is that when meetings are run well and used for the right reasons, they can be a powerful force for achieving your goals. This is more likely to happen in an organisation that has an agreed, structured approach to how it runs its meetings. So, to help you achieve this, we’ve packaged everything we know into an innovative training solution, which is delivered over 2 x half day training workshops, with a few weeks in between each. If desired, we can also measure the training’s impact and return on investment, for an additional fee. Take a look at this case study to see the impressive results we achieved with a client earlier this year. The workshop generally assumes a maximum of 15 participants. 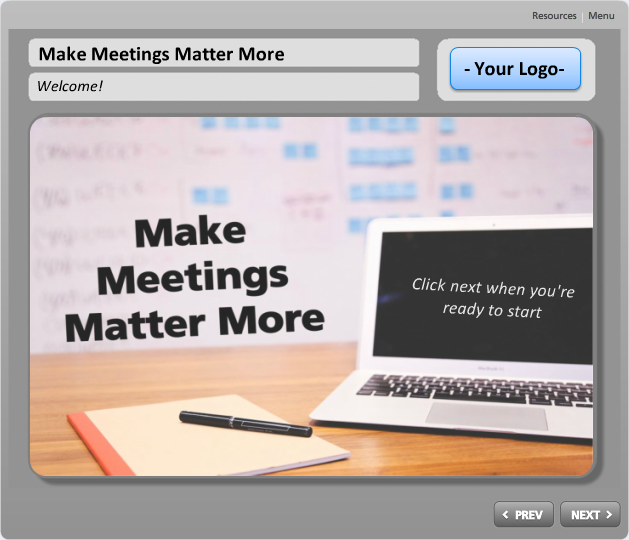 A consistent, proven approach to help your meetings drive results. This is not just a rehash of the tips and lists you’ll find all over the internet: we’ve created brand new, practical frameworks, exercises and tools and combined these with timeless best practices to ensure it delivers results. – Reinforce and embed the main content. – Discuss and answer all questions. – Tailor the concepts and frameworks to YOUR situation and needs. – Agree a ‘meetings charter’ to encourage the right meeting behaviours. 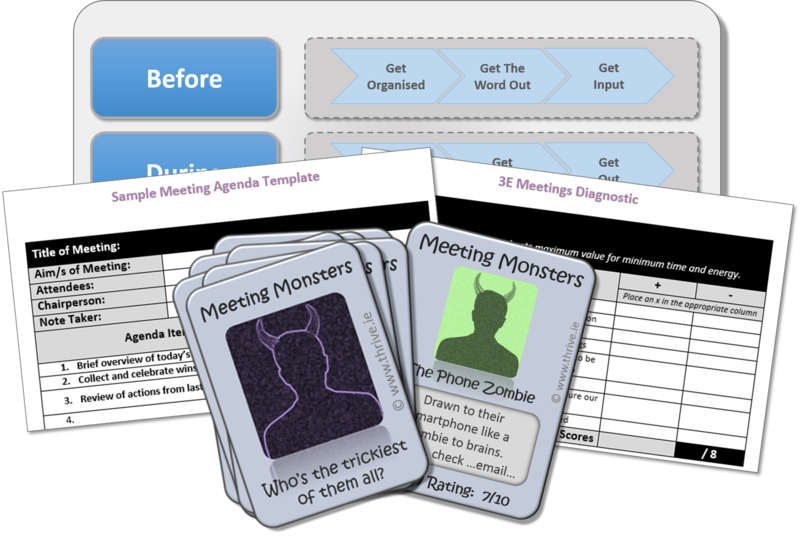 – Conduct some real life practice of a selection of meeting scenarios. What exactly is covered in the training? – What is a meeting? – When should you have one (and not have one)? – What do people dislike about meetings? – What are the benefits of a well-run meeting? 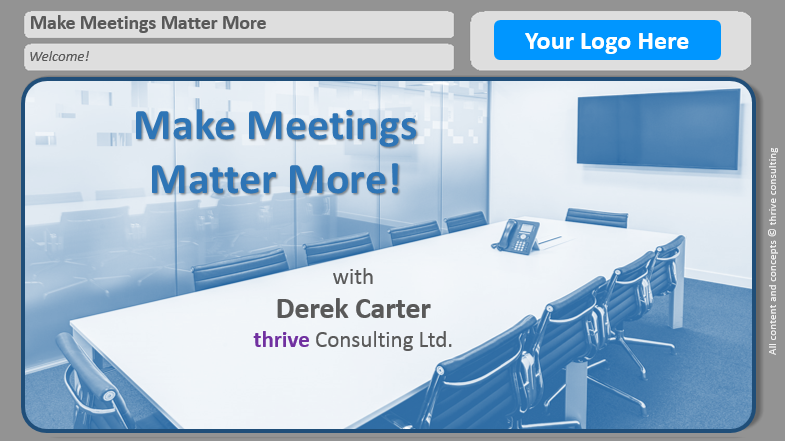 – How do you measure how valuable your meetings are? – What are the various “tricky” behaviours people have in meetings? – How can you handle them? – What tools and technology options do you have? – When is each solution appropriate / of benefit? – a simple table-top reminder of the main points from the training. Bewley’s have used this training and give it their stamp of approval! 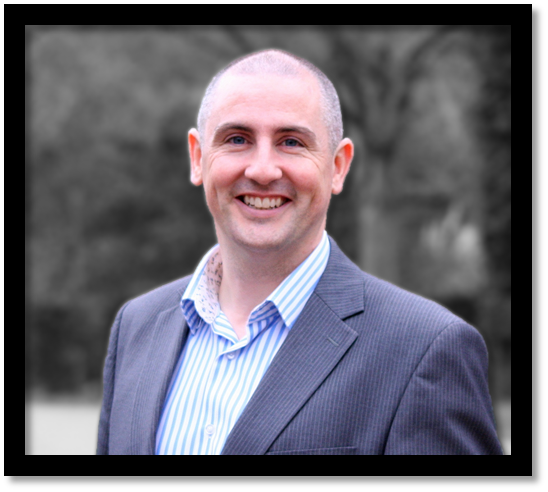 If you need help and you know you can improve your meetings’ ROI, then this training has been designed for you. Nobody likes the hard sell and nobody likes to pay money for something they haven’t seen or tried, so if you’re interested at this stage, just email derek@thrive.ie and he will answer all your questions. *** e-Learning Option*** We can also deliver a blended learning solution, with the first half-day being replaced by can click here to watch a short screen-capture video and get a taste for the content and design of the course. 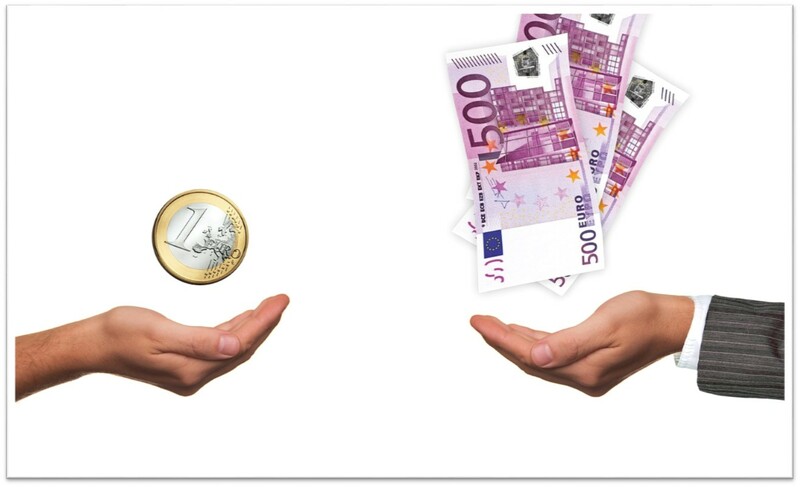 – Deliver a positive return on investment – for everybody! So, go ahead and drop us an email!